This line of mag particle testing meters will help you check and measure the performance of your magnetic bench, electromagnetic current generator or other magnetizing equipment as part of your regular system performance checks. 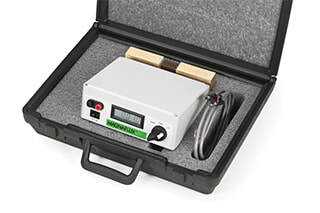 The QB1 is a Go/No-Go gage to demonstrate the quick break function of 3-phase full-wave DC magnetic particle equipment is functional for superior magnetic particle inspection quality. This quick break tester is placed inside the coil (or in line with a cable wrap) during a magnetizing shot, and checks whether the current flowing through a coil is shut off rapidly at the end of a magnetizing shot (this quick shut-off is commonly referred to as Quick Break). Correct quick break function is indicated by illumination of the LED on the tester. Using the QB-1 to check your 3-phase FWDC magnetic particle inspection equipment will help ensure residual field is properly developed during processing and gives sharper resolution of transverse indications. For use with 3-phase full-wave DC equipment only. The QB-2 is a microprocessor-controlled shot timer and quick break tester which provide quantitative verification of magnetic particle equipment performance by confirming quick break function and measuring magnetizing shot duration, for better magnetic particle inspection quality. The QB-2 probe is placed inside the coil (or in line with a cable wrap) during a magnetizing shot, quick break voltage and shot time seconds are alternately shown on the LCD display. A reference table of minimum quick break voltages for different coil diameters is included on the back of the meter. Using the QB-2 to check your 3-phase FWDC magnetic particle inspection equipment will help ensure residual field is properly developed during processing and gives sharper resolution of transverse indications. For use with 3-phase full-wave DC equipment only. Use the calibrated Ammeter Shunt Kit as part of regular system performance checks to ensure equipment accuracy and repeatability for the most consistent mag particle inspections in compliance with ASTM E709, ASTM E1444 and ASME BPVC. 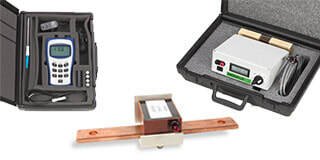 When the calibrated shunt is connected to the mag particle equipment output, either contact or coil, the digital ammeter provides a traceable reference standard for calibration and verification of the magnetizing equipment. The Ammeter Shunt Kit is specifically designed to accurately measure magnetizing current generated by Magnaflux magnetizing equipment. 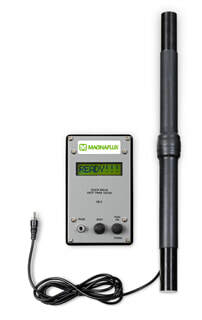 Equipment from other manufacturers may use different current control techniques, so the Digital Ammeter & Shunt may not give accurate readings for non-Magnaflux equipment. The Digital Hall Effect Meter portable gauss-meter measures the strength of AC alternating-current and DC direct-current magnetic fields. The hand-held digital guassmeter features an easy-to-read LCD screen and simple push button operation. Each Digital Hall Effect Meter comes with a traverse probe, a zero gauss chamber, batteries, operating manual and case. Full 7-point traceable calibration is included with each meter. The meter includes peak-hold functions, and readings can be displayed in Gauss, Tesla or Amp-Meter units.